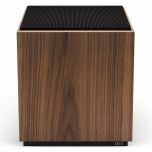 The wireless multi-room loudspeaker,made to play all your music, from any device, in wireless stereo. The unmistakeably warm and relaxed carlsson sound has returned. Today, almost all music has moved to the cloud. We think this is great evolut ion.